This initiative supported the national development of WHP through stakeholder forums, a toolbox of WHP tools and arguments to make the case for WHP. 22 European countries took part in the initiative. To improve the methodological knowledge base for WHP by developing a European WHP "toolbox"
Reports from the National Contact Offices (NCOs) indicated that there were both opportunities for development and significant barriers to the next phase of development of WHP in Europe. National policy holders were generally supportive of WHP, but had difficulties in disseminating and persuading employers to initiate WHP. Though the reasons for slow uptake vary between countries, a number of common problems emerged that were to be addressed by this Initiative. Firstly, many NCOs had not got well developed contacts with potentially interested employers and other stakeholders. The first sub project ‘National Forums’ addressed this issue. Secondly, Employers and others involved in implementing WHP did not necessarily have a strong methodological base to support them in doing so – the second sub-project (Toolbox) addressed this problem by collecting tools that support the implementation process. Thirdly, a more general problem was identified in terms of marketing the concept of WHP to all stakeholders, but employers and workers in particular. The third sub-project addressed this problem by developing a case for undertaking WHP (this is framed not only in terms of financial benefits) that can be used to convince people to become involved in WHP. The methods used in each of these projects varied considerably. For the national forums, the NCOs identified the main stakeholders in their country and invited them to take part in meetings whose functions were to establish a communications network for dissemination of information on WHP. For the Toolbox, the second project relied on two strategies – literature reviewing (particularly European literature reviewing) and on the nomination of tools known to be effective by NCOs. For the business case, the third project used literature reviewing as its main source of information. The Initiative concluded with a conference held in Dublin during the Irish EU Presidency. 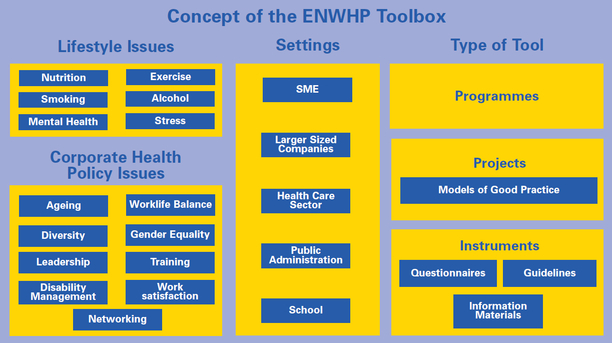 The ENWHP-Toolbox: a compilation of programmes, projects and instruments across different settings and health topics collected from European Countries. The Case of WHP: a detailed analysis of the private sector company case for investing in WHP (Business Case) based on an extensive literature review. National Forums/Networks: The installation of national forums/networks for WHP, which involve both institutional stakeholders and direct users like private sector companies, in so far 19 member countries. Dublin Conference: The 4th initiative was concluded by the 4th European Conference of the network, hosted by the Irish Ministry of Health and Children during the Irish EU Presidency term and jointly organised with the European Commission / DG Sanco (June 2004). Austria, Belgium, Bulgaria, Czech Republic, Denmark, Finland, France, Germany, Greece, Hungary, Iceland, Ireland, Italy, Luxembourg, the Netherlands, Norway, Poland, Portugal, Romania, Spain, Sweden, Switzerland, United Kingdom.